Pecknel Music - Our Grateful Praise! Print Music → Bonclarken → Adult Choir → Adult Choir Reading Session Music → Our Grateful Praise! 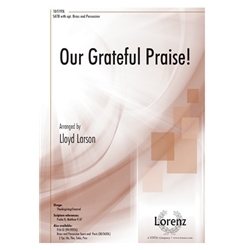 Lloyd Larson’s dynamic anthem includes three beloved and timeless Thanksgiving hymns that are sure to appeal to choirs and congregations alike. The optional brass provides an additional dimension of inspiration as the choir lifts collective voices in a passionate acclamation of thanks! Click here to hear a recording.